Tumors of the mediastinum are usually diagnosed in young patients, but they can develop at any age and form any tissue that exists in or passes through the chest cavity. The diagnosis and the accurate assessment of the mediastinum masses represents a challenge, given their clinical variability from asymptomatic to producing symptoms of cough, chest pain, and dyspnea. Mediastinal tumors encompass a wide range of various neoplasms. The localization of mediastinal masses is critical in the diagnosis: the anterior mediastinal masses are generally thymomas, teratomas, substernal thyroid/parathyroid tissue, or lymphomas; the middle mediastinum massess are typically pericardial and bronchogenic cysts; the posterior mediastinum masses are often neurogenic tumors and esophageal cysts. The wide variety of different entities demonstrates a heterogeneous spectrum of clinical and pathologic features, suggesting that a uniform “standard” management of these patients is not appropriate. 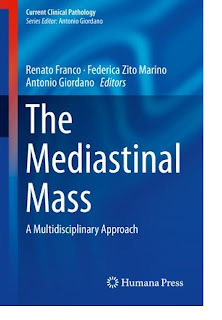 In this context, the proposed book will provide a comprehensive review of the mediastinal tumors according to different sites of the diseases, including the masses of anterior, middle and posterior mediastinum. The handling of these tumors requires a multidisciplinary approach due to the complex anatomy of the mediastinum as well as the different clinical, radiographic, and prognostic features. This book has risen from the desire to provide to the specialists in the field an easy, updated and practical guidelines title to facilitate the clinical practice of mediastinic masses. This book will be a comprehensive guide to clinical best practices developed through the opinions of experts in the field.